To a majority of readers more familiar with supermarket paperbacks than Penguin classics-- Jack Kerouac's On the Road seems on the surface as though it's most famous for establishing the author's challenging style of beat literature comprised of creative punctuation, bizarre sentence structure and dreamlike thoughts that went on for pages before he'd insert the final period. Yet, in spite of the meandering labyrinthine stream-of-consciousness that can easily overwhelm-- Jack Kerouac inserted four simple words that inspired the the following generation of hippies to take to the highways, interstates, and small town side streets with a little shoe leather, luck, optimism, faith in their fellow man, and (of course) their thumb when he typed, "the road is life." Of course, Kerouac's publication of On the Road was more than fifty years ago and as we just discovered via Warner Brothers' recent release of the--yes-- fortieth anniversary edition of Woodstock which means it's not only been forty years since Hendrix wowed the muddied masses with "The Star Spangled Banner" but also forty years since Neil Armstrong walked on the moon. And ironically, instead of wanting to continue adventuring and exploring, we've all gotten pretty used to our surroundings. Thus, with violence on the rise as we're endlessly reminded with manipulative newscasts that make us scared of our own shadow-- the mythical idea of Route 66 and the freedom to be had On the Road or journeying along with Steinbeck and his dog in Travels With Charley seems like the least rational thing our technologically advanced society would ever want to do. I mean give up iPods, BlackBerries, Starbucks, Facebook, and Wii? Are they kidding? And pop culture reaffirms these fears in every opportunity imaginable. Whether Hollywood scares us with fact-based Oscar fodder like Monster wherein a young woman starts hooking after catching rides from sleazebags on the interstate until she becomes a serial killer or in Into the Wild where one young explorer freezes to death in Alaska-- the bottom line is, it doesn't seem appealing to take to the road. Of course, these are respected films and I haven't even addressed the fictitious thrillers about people who take a Wrong Turn, get lost in The Blair Witch Project, tick off the wrong trucker a la Duel, Breakdown or Joy Ride, or meet their grisly demise in endless hitchhiker slasher movies. So when two seemingly intelligent, humorous, and good-natured young men decided to voluntarily test out the theory of whether or not kindness is still alive in these United States (or at least on our highways) by hitchhiking from New York City to Los Angeles in one week with the goal of not spending a single dime the entire way, initially as a viewer I began to fear for our protagonists from the start. Obviously, I knew both were alive and well since Ryan Jeanes-- who I hadn't realized at the time was the "hitcher" in the piece had contacted the site directly about his documentary-- but sure enough, I wasn't alone as in an attempt to buy time since they now admit on their website that "we were both afraid to start," Ryan and his director, camera operator, editor, friend, collaborator and fellow-hitcher Phillip Hullquist walked around New York City asking people at random what they thought of their plan. While a few acknowledge tentative "what the hell? life's an adventure" pieces of encouragement, a majority manage to say exactly what I was thinking which is, "man, that's just too dangerous." Intriguingly, although I was thinking of the logistics and indeed the safety questions since as a film critic, I'm very familiar with the "crazed hitcher" or "innocent hitcher gets ride from crazed lunatic" genre, some of the scenarios dished up to Ryan and Phillip by people on the street were more colorful than most horrific B-movie plots involving wild urban nightmares of being held hostage in a basement for seven years or threats of being disappeared to somewhere else entirely etc. Obviously, the opposite of a pep talk and more like those campfire stories kids take turns telling to try and freak the hell out of the other kids at sleep-away camp-- amazingly, Ryan and Phillip start their journey which ultimately consists of twenty-three rides. While I won't share whether or not they meet their goal, which they made all the more urgent by purchasing a plane ticket to fly home from L.A. meaning they'd miss their flight if they didn't manage to make it across the continental U.S. in seven days-- I was surprised by just how entertaining the movie turned out to be. And it's bolstered no doubt by Ryan's naturally charming personality as he makes an ideal host/protagonist for the documentary (reminding me of a funnier but less political version of Super Size Me's Morgan Spurlock). As aside from some understandable moments of frustration especially when they hit a dead standstill in St. Louis for a very long period of time-- he somehow manages to remain likable, upbeat, and positive throughout but the most impressive aspect about The Hitchhiking Movie is to be found via its exceedingly impressive post-production polish. Despite a few typos here and there, the editing by Hullquist is first rate and it must have been one extremely long and tedious process of pouring over countless hours of footage. While I didn't have enough time to listen to the commentary tracks (including one described as "drunk") so this answer may actually be revealed in the other audio options, I was fascinated by the technical aspects of the process, longing to find out more about that side of it as well as how they kept charging the batteries for the camera and Ryan's cell phone throughout. Livening up what could otherwise have been a pretty long one-note journey of Ryan Jeanes hoofing it across the U.S. and trying to snare some rides (minus Claudette Colbert's memorable sultry leg tease in It Happened One Night),not only is Jeanes a terrific on-screen presence as the documentary alone could be served up as a TV correspondent audition tape but Hullquist's instincts to whittle it down and sharpen the focus made it compulsively watchable from start to finish. Thankfully inserting much needed subtitles to make up for the lack of professional boom mics and sound equipment so we can gain a greater understanding of the alternately wonderfully memorable stories of those nice enough to give the young men a ride as well as some of the incredibly strange anecdotes-- Jeanes also layers the piece with narration that compliments it perfectly and goes right in sync with post-production graphics that appeal to short attention spans. Tallying up the free stuff shared with the hitchers from bananas to fast food and the countdown of the trip-- they also provide us with a visual breakdown of the journey (stopwatch, location etc.) -- all of which raised the level of this screener to a far more professional degree than I was expecting. 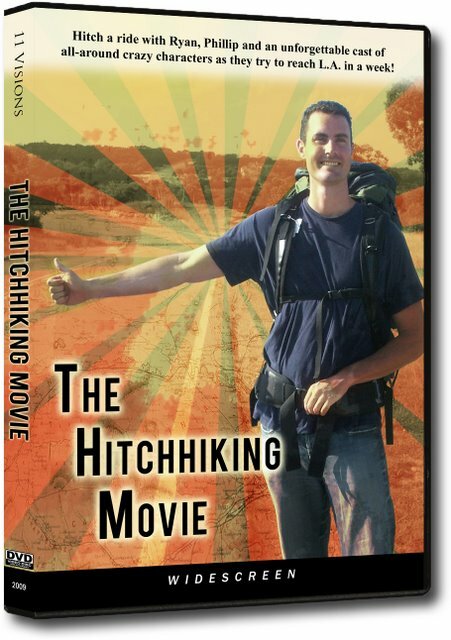 The film is for sale on their website as part of their 11 Visions company where the guys interact with fans who encourage them to embark on other adventures (including one they're tackling this summer). And despite a title and premise that makes you immediately worry that The Hitchhiking Movie is an indie slasher pic-- it's a funny and endearing celebration of the American spirit and life on the road which Kerouac said is "life," and the thousands of people we pass along the way whether they're in cars, on sidewalks or on the interstate trying to dodge the local police.